english, A limited amount of ASL/See Sign sign language. After living in San Francisco for 15 years I wanted the quieter, slower-paced life of wine country! It has lived up to all my expectations and now I am happy to have the opportunity to share it with visitors to the area. I live on the property (the rental is an in-law unit to the house), so I take pride in caring for the property. After many years in the software business I decided to shift careers and am now a Certified Specialist of Wine and work at a local winery. I've traveled all over the world and am now very happy to call Sonoma home--which is like being on a permanent vacation! I settled in Sonoma because I wanted to live the "wine-country" life and it has been great. I purchased this property after living in the area for a while. I loved the house as soon as I saw it because it met all my needs, plus had an in-law unit. The neighborhood is wonderful with a very nice mix of neighbors from different backgrounds who are all really friendly and always up for a chat when out walking. There is a patio in the garden with a table, umbrella and chairs, which are perfect for relaxing with a glass of wine or for dining outside. You can cook in after shopping at some of the markets within walking distance or driving to larger stores in the area or you can select from restaurants within walking distance with several options for take out food or fine dining. A breakfast and lunch place and a coffee house are just a block away. Towels for 2 with additional towels available in bathroom closet. Bathroom is spacious with drawers available for unpacking and stowing personal items during your stay. Hair dryer is available. Cleaning supplies are located under the sink should you want to use them during your stay. Additional linens located in bathroom closet. Wifi available. Password located in information binder in the unit. 4 full sets of towels. This is a joint living space/kitchen. Full size refrigerator, with ice trays in freezer and cold packs to use for picnicking while here. Some items such as salt and pepper and oil are kept in the kitchen. A supply of dishes and cookware are available including pots and pans, measuring cup and strainer. The kitchen was remodeled in 2015. Microwave, stove, refrigerator & Keurig coffee maker all in like new condition. Dishes, pans, bowls & utensils for cooking are available, including a food processor. A dining table and chairs are available in the living space next to kitchen, as well as a table and chairs on the patio for dining outdoors. There are a few books on a shelf in the bedroom. The lawn and garden area are available to renters. The unit is attached to a large grey house which I live in, but the unit has a separate entrance. The garden wraps around the whole building. With table, umbrella and chairs. I am a certified specialist of wine and founder of Uncorking Sonoma educational wine tasting classes. I am happy to provide recommendations on wineries to visit and renters receive a discount of $10 per person if they would like to do an Uncorking Sonoma class. This place is so spacious and welcoming! It was much larger than the photos show and it’s sparkling clean. It has everything a guest could need for a long trip. My stay was very peaceful. The bed was unbelievably comfortable and the black-out curtains were perfect for blocking out the morning light. The yard and house are so beautiful as well. Parking was easy every night. I enjoyed my stay so much and am very grateful for your hospitality. Thank you! Lovely space in a great location with a nice yard for outdoor eating. The apartment is clean, comfortable, and spacious, with everything you need for making your own meals, such as full size fridge, microwave, oven and stove. Just be careful about parking under the tree outside your entry gate - a large branch fell from the tree and scratched up my car. I enjoyed my stay as it provided an easy transition for a permanent move from Malibu to Sonoma. Very spacious and comfortable bedroom and bathroom. The apartment is fully equipped with all that one needs for a long stay. Nice garden. Christine was a gracious hostess and assisted with mail delivery. Thank you very much. Well appointed place and quiet neighborhood. 10am checkout is too early especially considering the region. $1500 damage deposit is excessive and 17 days after checkout still not refunded. Owner was responsive and sent great details before check in. Will consider increasing rating dependant upon refund outcome. We had a wonderful stay at Christine's rental! It was clean, spacious, had all the needed amenities, and then some! There are so many eateries and shopping options within minutes. We definitely recommend it! 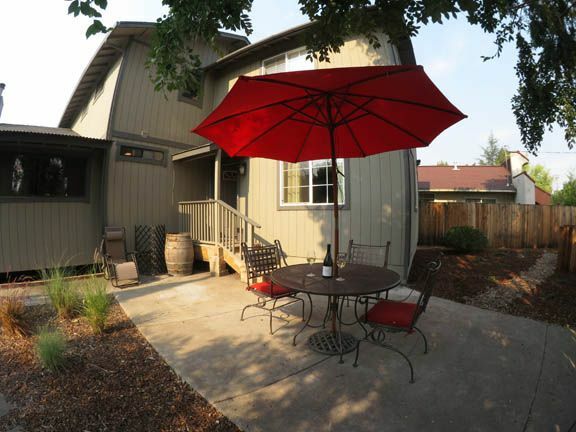 This was the perfect place for our week long stay in Sonoma. For the two of us, there was plenty of room and everything was well maintained. It is walking distance to a nice breakfast place, and less than a 10 minute drive to the Plaza. The patio area was a perfect place to unwind at the end of the day. We would stay here again! All of the wine-country activities you could want are close at hand. Sonoma is a charming, historic town with lots to do and see.